This new luxury home has the best view on Beech Mountain NC! A serene long-range mountain view of 3 states and 7 meadows. Vacation like the 'Rich and Famous' in the mountains at a price anyone can afford. This home can easily accommodate 2 or 3 families making it the best deal on the mountain. It is custom designed and the home is furnished with mountain cabin style motif, home sleeps 14 - 18 and has everything you need for the most exciting vacation ever! 3500 sq ft. 5 BR (includes 2 masters), 3 1/2 bath, 3 fire places, loft & game room floor. Two 50-in HD complete with Direct TV 200+ channels service. Wireless high speed Internet included. Two wet bars: located in the loft and game room for convenience. Two 100 ft. porches with swing, rocking chairs, propane BBQ grill and picnic table to enjoy your outstanding view. Located only minutes away from the Beech Mountain Ski area and an amazing waterfall on Pond Creek Trail. There is no other vacation home like this in the Beech Mountain area. Please watch the you tube video on this site to see if you love it as much as I do! If we dont have it, you dont need it! This Gorgeous Mountain Home Unfolds on 3 Levels: Level 1 Main Floor Includes the Fabulous Kitchen with 15 Foot Buffet Siltstone Counter, Great Room with Remote-Controlled Instant-Light Gas Fireplace and 50” HD with premium Direct TV, Dining Area, Great Room for Relaxing and Wood Porch with Gas Bbq and Picnic Table. Our outstanding Long Range Mountain View is of 3 states, 9 mountain ranges and 7 meadows! Also Included is the Master Suite with Private Porch Access , Master Bath Including Jacuzzi Tub, Walk-in Closet, Separate Shower and Two Sink Vanity. Upstairs in Loft Area, Level 2: Includes Siltstone Wet Bar with Refrigerator, Another Remote-Controlled Instant-Light Gas Fireplace, Lounge Area with Queen Sleeper Sofa, Great Views, Two Queen Bedrooms and Shared Bathroom with Tub/Shower. Downstairs Level 3 Area Includes: Game Room with built in wet bar, 50” HD Premium Direct TV, ping pong table, darts, wall hooky, board games and more! Very high quality home with plenty of amenities and a stellar view! Absolutely a Wonderful Mountain Home!!! Beautiful, open floorplan, great for large groups! Lovely ski weekend! Beautiful house and lot! Great views. Great house for a big group! We had 4 families with us and the house was the perfect size. Two living rooms made it easy for the kids and the adults to have their own space. Highly recommend this house. The house was great! Had alots of amenities. Definitely recommend taking a bath in the jacuzzi tub in master bedroom. Water stayed hot long over 30 mins, which was amazing to me b/c most baths get cold after 15mins. The playroom and mutli bars on 2 floors was nice. We had 4 families (9 adults & 3 children) in one house and it was plenty of room. Property Manager was always quick to answer all of our questions! Also, being close to Beech Mountain ski resort was a huge plus! The only issue we had was with the satellite TV system and entertainment. It is a little tough to understand but we figured it out after a couple phone calls to property manager to fix. Overall everything was wonderful and the view is to die for! Thank you for everything! Located within minutes of Beech Mountain Snow Ski resort, ice skating and tubing. Enjoy shopping, fabulous restaurants, bars and more! Spring in High Country brings amazing color to your view. 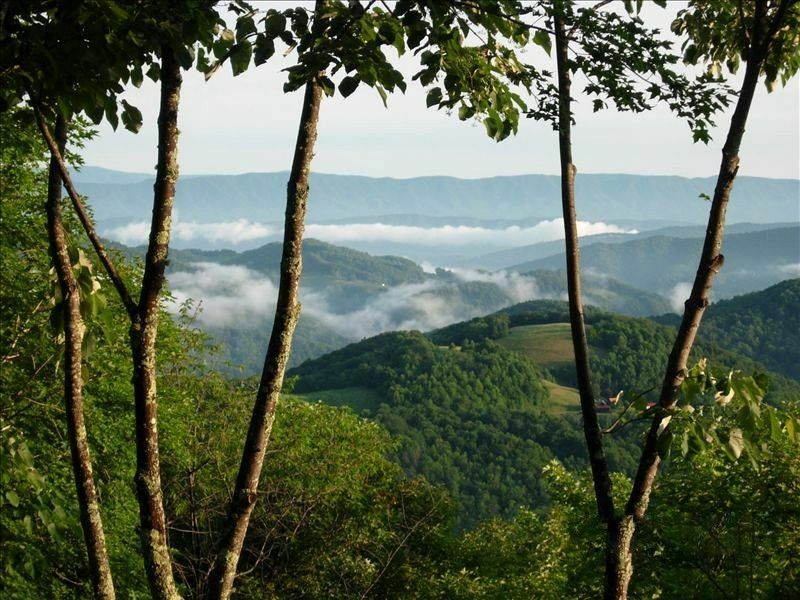 The Blue Ridge Parkway with amazing scenery and trout fishing is just minutes away. There are many great attractions close to the home including Grandfather Mountain, Tweetsie Railroad a great amusement park for young children, Linville Caverns, and Linville Falls just to name a few. Summer offers escape from the heat since nature provides the natural air-conditioning. Summer sports include golf, whitewater rafting, tennis, fishing, hiking, swimming, horseback riding, caving, gem mining, wild life viewing. Be sure to try the latest exciting thrill 'Zip Line Tours'...fly like Superman through the mountains!! This home is just minutes away from a multitude of activities but far enough away from the hustle to enjoy the serenity of a peaceful long range, Seven Meadows view. Ski: We are only a few minutes from the Beech Mountain Ski resort. Seven Meadows has best view on the mountain. We also have the most beautiful home that has everything you could possibly need. If we don't have it. You don't need it!